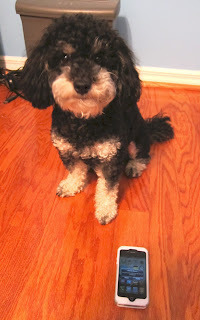 Today my friend Oreo is here to tell us about the iPhone apps that are available to pets and their families. Without opposable thumbs, we really need your help to use this gadget for finding a dog park. Won't you download an app to help us have a fun weekend? Check out the list of apps that are reported on today at All Things Dog Blog. There are all kinds of uses, including health, resources, GPS locaters, and the all important dog park locaters. See you at the park!